How to cook a delicious broth multivarka? 1 How to cook a delicious broth multivarka? 1.1 1. How to cook meat broth in multivarka? 1.2 2. How to cook chicken broth in multivarka? 1.3 3. How to cook soup of fish in multivarka? 1.4 4. How to cook vegetable broth in multivarka? 2 5. How to cook mushroom soup in multivarka? 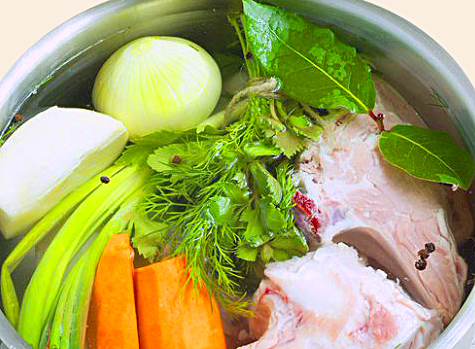 Conventionally, there are three kinds of broths, based on the technology of preparation: white, yellow and red. 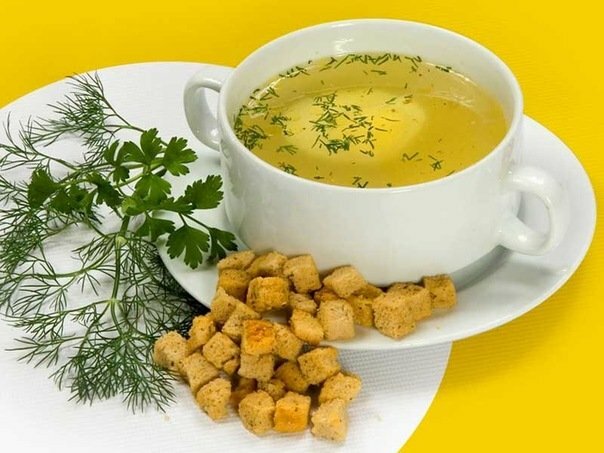 white broth made from unroasted ingredients, yellow - from unroasted meat or bones, but podpechennyh vegetables and roots, red It is prepared from the roasted meat, roasted vegetables and roots. soup cooking in multivarka It has its own characteristics, broth long languishing at a constant temperature, which has a positive effect on the quality, allowing a very tasty and nutritious broth. In this case, almost no foam appears, and all useful extractives go into the broth, saturating it with proteins and micronutrients. tasty broth secret - in perfect freshness of meat, which previously trimmed from tendons, films, washed with cold water and filled. If the broth need not greasy - carefully cut of meat or poultry with all the fat. Salt broth preferably before the end of cooking. Often when cooking meat broth multivarka placed in water and rapidly brought to a boil the regimes of "moonshine", remove foam, add vegetables and spices, and only then put "Quenching" mode. Many housewives first after boiling water is poured in general, pouring new, getting rid, in this way, from unwanted extractives. The meat can be boiled in one piece, but it is better to coarsely chop. The increase will take the number of meat or poultry, the richness of the broth will. Cooked soup can be frozen for future use, cool it and pour into plastic bags or special containers. 1. How to cook meat broth in multivarka? a piece of beef (pork, lamb) on 600-800 g (you can take the bones with meat), 2,5 liters of water, 1-2 carrots, 1-2 bulbs, Lavrushka, black pepper peas, allspice, salt, garlic, parsley root, celery. 1. Carrot and onion cut into halves and gently podpekaem in mode "Baking / Roasting". 2. In the cup to lay the vegetables cut into pieces of meat, salt, spices and fill water, close the lid and turn on the 2-3 hour program "Quenching", if only we take the meat, and if the boil meat bones, to the 4-5 hours. Bones can also be pre podpech in "Baking" mode to impart flavor. 3. We take out the meat, and broth necessarily we filter through a sieve. Council: that the bones do not scratch the finish Multivarki, Some housewives are placed on the bottom of a special silicone mat. 2. How to cook chicken broth in multivarka? 2,5-3 liters of water, a small chicken or chicken bones with meat 600-800 g, bulb, 1-2 carrots, garlic, a mixture of peppers, parsley or celery stalks, salt, Bay leaf, bell pepper. All we put into the bowl and fill Multivarki cold water on the label. Put "Quenching" mode 2-3 o'clock. Do not forget to drain the broth. 3. 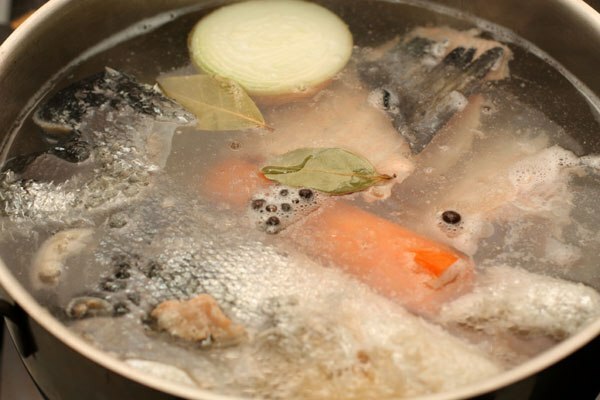 How to cook soup of fish in multivarka? 2,5-3 liters of water, some of which can be replaced with dry white wine, fish head, of which removed the gills, tailings, parts of carcasses or ridges, about 2 kg, bow, carrot, stems leek, parsley, allspice, Bay leaf, salt. Ingredients laid in multivarku, fill with water and put "Quenching" mode 1 time. we filter the broth. 4. How to cook vegetable broth in multivarka? 3 liters of water, 2-3 bulbs, 2-3 carrots,(you can optionally add white cabbage, cauliflower and potatoes), half a head of garlic, 1 parsnips or root and parsley, Lavrushka, celery, you can optionally add a little chopped ginger, allspice and black pepper, salt to taste. 1. We put "Baking" mode 20 minutes, We pour a little vegetable oil on the bottom of the bowl and fry the onion coarsely chopped, carrot, garlic, peremeshaem. 2. Laying the remaining ingredients and fill with water. expose "Quenching" mode 60 minutes. 5. How to cook mushroom soup in multivarka? 2-3 liters of water, 500-600 g fresh or 300 g of dry fungi, 1-2 bulbs, Bay leaf, black pepper, salt. Fresh mushrooms thoroughly washed sand, clean the damaged area, if necessary, further water fill, to remove sand. Dry mushrooms soaked in water or milk for several hours to swell. If mushrooms are too large, it is necessary to cut them. We put the mushrooms in a bowl Multivarki, Purified onion, black pepper, salt and put in the mode “Stewing” on 30-40 minutes, depending on the type of mushroom. Mushrooms should be soft, if necessary, prolong brew. onions throw, at the end of cooking, you can add the bay leaf. How to cook soup in multivarka?